Cells use the motor proteins that induce muscle contraction to stir their interiors. That is the conclusion of a recent investigation involving chemical engineers from Rice University, as well as biophysicists from Georg-August Universität Göttingen in Germany and the VU University of Amsterdam in the Netherlands. Researchers were able to track single molecules inside living cells using carbon nanotubes, a technical achievement that is shedding new light onto biological transport mechanisms in cells. In the study, which was published this week in the journal Science, scientists attached carbon nanotubes to transport molecules, known as kinesin motors to visualize and trace their movements trough the cytoplasm of living cells. When the researchers exposed the cells to drugs that suppressed the specific motor proteins, they concluded that the type of motor protein used for muscle contraction is also the one responsible for stirring the cell’s interior. Thus, when the motor proteins were suppressed, so too was the stirring movement in the cell’s cytoplasm. Cells contain a mechanical cytoskeleton that is composed of a group of protein filament networks, such as actin. The motor protein myosin forms bundles inside the cells, which actively contracts the actin network for a short period. Randomly pinching the elastic actin network with the contracting myosin bundles results in global internal stirring of the cell. Actin and myosin both play similar roles in muscle contraction. Conversely, long distance displacements within the cell usually involve the cell’s use of motor proteins tied to lipid vesicles, the cell’s “cargo containers,” which form long axons of nerve cells. However, this process requires a “package, attachment, and orientation” within the cell as well. 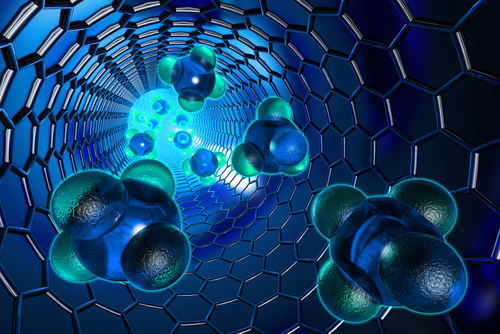 Carbon nanotubes are hollow cylinders of pure carbon with one-atom-thick walls. Professor Rick Smalley from Rice University discovered a decade ago that carbon nanotubes fluoresce with near-infrared wavelengths when in contact with visible light. Thus, by the time researchers attached the nanotubes to a molecule, they functioned as beacons to be traced over long periods of time. “Any probe that can hitch the length and breadth of the cell, rough it, slum it, struggle against terrible odds, win through and still know where its protein is, is clearly a probe to be reckoned with,” said lead author Nikta Fakhri, paraphrasing “The Hitchhiker’s Guide to the Galaxy.” “In fact, the exceptional stability of these probes made it possible to observe intracellular motions from times as short as milliseconds to as long as hours,” she said. The new discovery promotes a better understanding of cell dynamics, and points to the possibility of designing “active” technical materials, according to the researchers. “Imagine a microscopic biomedical device that mixes tiny samples of blood with reagents to detect disease or smart filters that separate squishy from rigid materials,” said Fakhri, who is about to join the Massachusetts Institute of Technology faculty as an assistant professor of physics. A model developed by VU co-author Fred MacKintosh, which uses elastic properties of the cytoskeleton and the force-generation characteristics of the motors, improved the accuracy of the measurement of the internal cell fluctuations. The study was supported by the German Research Foundation, the Dutch Foundation for Fundamental Research on Matter, the Netherlands Organization for Scientific Research, the Welch Foundation, the National Science Foundation and the Human Frontier Science Program.